Oh, so you want to be the next hot band in the Texas country scene? Well that’s cute. So you got your heart broke once and wrote a couple of songs, then convinced a few of your friends to hang out in a garage after work and hash them out. But this isn’t L.A. and it’s not even Nashville. If you want to make it with the heavyweights who’ve logged hundreds of trips back and forth across the Red River, you have to bring it, and bring it hard. If you crave notoriety in Texas music, you better take to writing songs that can make folks dance one moment, cry the next, and would get Townes Van Zandt to crack a smile. You better instill your songs with those gritty, real world experiences indicative of Ray Wylie Hubbard. And I’m not just talking about a handful of them. You must field and entire album and live set’s worth of songs that steal listener’s attention without a slacker in the bunch. You slip up, and there’s a bevy of thirsty pickers and writers right behind you ready to take your place, and you’ll be judged every moment by how you hold up against the catalogs of contemporaries like Evan Felker of The Turnpike Troubadours, Cody Jinks, and William Clark Green, as well as present-day legends like Randy Rogers and Wade Bowen, and founders like Joe Ely and Jerry Jeff Walker. You better be a master of your instrument, but you better also know not just how to move your fingers, but how to make the melody of a song sound like divine harmony to awaken the angelic choirs of the brain. The songs from the top Texas artists are not just a way to pass the time, they’re the wings of stories that will take listeners to somewhere well beyond the methodical drone of their everyday lives. In short, you better have the ability to change people, mend hearts, and make grown men weep, or you might as well go home. And you better have a fiddle in your band. There’s a lot of flat land in Texas and beyond, but nowhere is the land as flat as it is on top of the Llano Estacado stretching between Lubbock and Amarillo in the west Texas panhandle region. Beaches may inspire romance like none other, mountains may uplift with their majestic vistas, the vast lakes and dense forests may create wonder in the beholder, but it’s the emptiness of the Texas plains that have charged songwriters for generations now to fill that void with words and song, to try and impart to listeners the lonesomeness one feels when surrounded by nothing, and what it means to have something that seems so bereft of obvious beauty mean everything to you. The latest to take up their little musical instruments and songwriting tools to the task is the Lubbock-based country band Flatland Cavalry. Young, fresh-faced and hungry, they’re looking to carve their own little spot out in Texas music and beyond for fans that that don’t just want to hear, but listen. “Easy on the ears, heavy on the heart” is how the group presents themselves, and this is probably a fair representation of their first full length album Humble Folks. Comparisons to the Turnpike Troubadours, where you have weight in the songwriting, but harmonious appeal in the music, are probably fair as well, making for songs that are both sensible and substantive, and can draw large crowds from resonating with a wide range of country listeners. If anything, Flatland Cavalry may cut a little too close to what makes the Turnpike Troubadours special, docking this new project some initial points for originality. 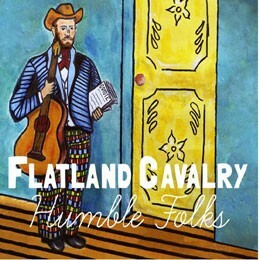 The way that Flatland Cavalry leans on the fiddle, and offers up heartfelt stories of life and lost love could almost make you think you’re listening to a forgotten Turnpike album, if the voice only sounded more like Evan Felker. But the singer and songwriter is a cat named Cleto Cordero, and he started the band a few years back with roommate and drummer Jason Albers. They added Jonathan Saenz on bass, Reid Dillon on electric guitar, and a fiddle player named Laura Jane, and Flatland Cavalry was born. It always adds a layer of legitimacy to a band when a female is involved, and the fiddle melody of Laura Jane is very much where the sound of Flatland Cavalry springs from. And ultimately, if they sound like the Turnpike Troubadours, is this such a bad thing? They still have a little work to do though. They need to decide who they are beyond Turnpike Troubadours fans. What is Flatland Cavalry’s unique sound and spin on country music that will inspire others to attempt to recreate the magic they make? Texas country and Red Dirt have just as much fat to trim and phonies as mainstream country does. But what distinguishes this music is its ability to not just convey words and song, but an indescribable feeling that is indicative of a specific region, yet speaks to many people across the United States and beyond. The words and music are not enough. You have to include that feeling, that soul that either have, or you don’t. 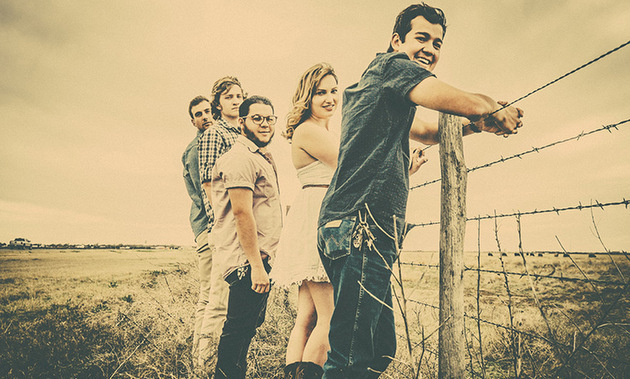 Flatland Cavalry has the songs, and it also has the players. But most importantly, it has that Texas soul so many stretch to attain, yet few capture. And this makes them a band worth listening to now, and watching for in the future. Nice song, good band. I’m not sure about the singer’s voice, it’s definitely different. However, that’ll probably end up being a good thing for the band. I look forward to seeing their career progress. So here goes my little rant(if asking a bunch of questions counts as a rant). This doesn’t have anything to do with this band, this is about Trigger’s comments on originality. As an aspiring performer, one thing I’m scared of is a review that calls my music bland, boring, unoriginal, overdone, sappy, cliche, or mediocre. But that just begs the question- what makes music original? What makes it good? What makes Trigger give two thumbs up? For example, Whitey Morgan’s music is not original. It’s great, but not original. Dale Watson, one of the best country artists out there, isn’t really original. At the end of the day, Sturgill Simpson isn’t even all that original(not bashing Sturgill, but you get my point). Trigger gave Whiskey Myers'(my favorite modern band) last album a great review, but they don’t have a very original sound. Basically, I just want your opinions- What makes music original/good, as opposed to cliche/bad? Well, that wasn’t really a rant, but I hope I got my point across. Trigger, I hope you don’t take this as being upset at you, I’m just curious as to what your, and everyone else’ opinion on this is. To be completely honest, you will not write and perform anything truly original, no matter how hard you try. However, you can do what we artists all have to do no matter what our medium is–you can take something known and familiar and put your own spin on it. Tell stories. Write hooks. Do something with your instruments. Keep on going. Fulfill yourself first and others second. Thanks, I appreciate your feedback. However, since you said that no one can truly be original, what makes one artist who writes their own music and songs better than another? I guess you just have to keep trying and hope people like it… anyway, I appreciate it. In my opinion, you’re overthinking this. Part of the issue with music debates these days is that old false belief that quality of art is entirely subjective, when that just isn’t the case. Take one of Jason Isbell’s songs, for instance, and pair it up with something like “Vacation” by Thomas Rhett. There’s absolutely no way that another individual is going to put forth a convincing argument that “Vacation” is the better song, because it simply isn’t, and that’s observable. The better artists tell better stories, have better hooks, understand structure and placement, where imply and where to outright state things, etc. The better artists separate themselves before people can flock to them. Haha, well of course anything Jason Isbell writes will blow Thomas Rhett right out of the water. What I meant was one good song compared to another- but I understand what you mean. Thanks for the discussion. A painter once told me that the mark of an original artist is to say something fresh with your art in an accepted framework . As a professional photographer at the time , that went a long way to helping me understand creating ‘ original ‘ work . In my case ,it was a roughly 3 to 4 ratio in terms of the two dimensional canvas I was creating on . Rollo May wrote a book called THE COURAGE TO CREATE that addresses this idea of originality . I highly recommend it .
. So the task is , using accepted forms of presentation , to find a way to have YOUR painting stand apart from the other 100 paintings hanging on the wall at the gallery . You have more ammunition to achieve this goal than you might think you do when you first accept the framework and the challenge . Once you develop your skills with all of the other tools available , you will completely accept the framework as what it really is ….a short cut to the viewer or listener as the case may be. The reference is lost in the distant past, but I recall Keith Richards saying that there are only seven original songs, and that is all there ever will be. To me, that means a songwriter can only hope to pick the right pieces and run them through the filter of their own experience. If what comes out is something that the performer ‘owns’ and the listener ‘buys into’, then you have a song. There are only so many ingredients to a meal, too. As long as there are new chefs creating great meals, there can be new songwriters writing great songs. What I meant by saying Dale Watson wasn’t original had more to do with his music style, which is very similar to Merle Haggard and Buck Owens, and less with his songwriting. I think he’s a great songwriter, better than Whitey(not dissing Whitey of course). Trig a typo correction and a question of sorts. You added an “s” to William Clark Green in the second paragraph. On that note you didn’t mention that he is featured on on the song “Coyote”. Also you didn’t mention that Kaitlyn Butts is featured on the song “A Life Where We Work Out”. I don’t think WCG really cares but Kaitlyn is a very new artist and probably deserves the mention. Was wondering if that an over site or did I miss something. Otherwise a very good review. He didn’t mention a single song from the album, for shame! It was also #2 on iTunes most of the day it was released, second to some Chris Stapleton dude. Album is solid and has lots going for it. It doesn’t make me think of Turnpike Troubadours either, though that wouldn’t be a bad thing at all. Well worth the money I spent on it. Sorry, but I’m just now seeing these comments for some reason. Album reviews are inherently boring, and nobody wants to read them, unless they’re for some controversial artist or highly-buzzed album. They’re also inherently full of cliche writing, because there’s only so many ways you can describe music, especially when you focus on just one genre. Sometimes I mention songs in my review, sometimes I don’t. I usually don’t mention players in a band, but this time I did. But I have no obligation to mention anything, though I mention more than most because my review are much longer than the average. Go read a review in Rolling Stone: it’ll be one paragraph, maybe two. This review was already getting long, and so I didn’t want to delve into the songs. I thought all the songs were great, so selecting ones out and mentioning guests was just something that I chose not to do. Ultimately I am just trying to get as many people to pay attention as possible, and hopefully they find the review interesting enough to read it and check out the album. Hey man. Your reviews are greatly appreciated. I think you are taking my comments other than the way I meant them. This is the site I turn folks to Trig so if you think I was bashing your review I was not. Trigger, I know you hate when people ask this, but are planning on reviewing the new Robbie Fulks album? It’s definitely on the list. You have the best reviews. Keep it up. I read another review on this album this morning and then bought the album. Found out they also have an EP, and bought that as well. They do sound a little similar to Turnpike, but that’s not a bad thing in my book. I’m really like these guys so far. “February Snow” and “Tall City Blues” are two really great songs. Haven’t dug into the album much beyond those songs, but I don’t mind the Turnpike comparison. We need more bands that attempt to be like Turnpike Troubadours WAY more than we need another band copying hacks like Casey Donahew or Josh Abbott. It starts off slow with the first couple of tracks but once February Snow starts, the album really takes off from there. I really enjoyed it and listened to it a bunch over the weekend. Definitely a Turnpike Troubadours feel to it but that’s alright with me. I saw they covered Kansas City Southern at a recent show so they aren’t shying away from the similarities. On Trigger’s opinion about them needing to figure out who they are – It’s one man’s opinion and review. It isn’t Gospel. I think it’s a hell of a debut for guys (and gal) in their early 20’s. Cleto has that intangible in his vocal that forces the listener to pay attention. I think overall they’ve jumped many rungs in the over-populated and watered down Tx-Red Dirt space. It is my job to find something critical to say about every piece of music I review. The “better” I think it is, the more important it is that I try to find a flaw. If saying a band needs to think about what can make them unique is the worst thing I have to say about them, then you’re doing pretty good. “If asked my opinion of where they should go, I would tell them to train their eye on a more distinct direction and hold to it. It could be to be more hard country, really work to evoke Waylon with even more steel and thumping bass drum/half time stuff, or they could go in Ray Wylie Hubbard”™s “grit & groove” direction. Or even better, they could go in direction all to their own, but I just want a little more from them, and I want a little more because I feel they have a little more. I want them to lead. They have the licks, they just need to do something to distinguish themselves from the herd. Safety might bring you short-term success, but it won”™t bring you glory. Good group with great sound. “No shade of green” is probably my favorite by them. I’m not musically literate enough to discuss lyrics, arrangement, or any of that stuff but I agree with Trigger’s premise of “Texas Soul”. You just know it when you hear it. My personal favorite was ” A Life Where We Work Out”. As soon as I listened to it I was hooked to how heartbreaking it was and I couldn’t help but throw it on repeat. I like it a lot. But as a Panhandler I’m biased. I hear an awful lot of John Edward Baumann, more so than Turnpike Troubadours, which is fine by me. And Coyote could be Corb Lund. Again, all good and fine. Very insightful review and gives the band some things to think about. Tend to agree that there is still some work to do. The songs show more strength and maturity when they deviate from the love sick-wounded victim stuff. Those songs don’t have the lyrical gravitas and depth yet, although the fiddle sound rescues those songs by providing the tangible emotion and feeling sometimes lacking in the lyrics. Maybe that will come with age and expanding horizons a bit. Songs like Stompin Grounds and Tall City Blues and even Coyote are much more poignant and applicable to a broader range of fans. Overall, a very good album and impressive performance on the charts although I must add that for a Texan, the lead singer’s hat sits too far up on his head and ends up looking like an ill-fitted topper. It doesn’t do it for me and I just really don’t care for it. Not that this is a bad record (by any means). I’ve read/heard several different sources/people giving that same Turnpike Troubadours reference to their sound, and I really don’t understand that. I could easily draw a line in my musical listening tendencies by pre- and post-Turnpike. My first memory of hearing and seeing that particular group continues affect me. Personally, it sounds similar to what would happen if The Lumineers did a “Lubbock (On Everything)”-esque concept album. It wouldn’t be bad (in the grand scheme) but it’s not Terry Allen. I’m having a difficult time understanding the insanely high-praise, from most of the places I keep up with, for this album. After numerous listenings, it all just blends together for me. Nothing about this album is particularly striking, in any way. Also, being a Panhandler, I don’t really “feel” this album. The words seem familiar, but distant. Like H.G. Bissinger writing about Texas high school football. Poignant observations, but mere observations nonetheless. Anyways, ’bout a week short and a dollar late, but I just don’t get it. I am kind of on the same page as you. I saw some people start to mention them and knew a review had been posted on here so I listened to this album last night before I read the review today. There were a few songs that I liked and I didn’t necessarily dislike the rest, I just can’t decide if I think they are the real deal or if they’re corny. Some of the lines are too easy and too twangy to seem authentic and up to the standard that they are being praised at. Nothing really stands out to me except the lead singers voice, which I think is a little plain. I prefer to see a band live before I go with a solid yes or no and this band will be no exception. I just don’t know if I’ll get there with them. This was after having seen them live twice, about a year ago. Guy Clark wrote original music and changed the notion of the “seven songs” created or passed on by Keith Richards. No one, not even Townes wrote songs about food, Homegrown Tomato’s, Texas Cooking, greasy enchiladas and a beer to wash them down, no male wrote songs from a female point of view like Guy and no one wrote the poetry of the Carpenter and boats to Build with the timeliness of LA Freeway and Desperadoes Waiting for a Train or the Randall Knife’s tribute to a father. As Steve Earle wrote: goodbye Michelangelo. I point this out only because while not every artist is original there is a genre of Texas Music that all the above, those both dished and loved fall into that you don’t find everywhere, its what makes Texas Music have soul and special.